We’ve been monitoring websites from the piers in the greater Virginia Beach area for a few months now. Most advertised the best blue crabbing in ages. Not being local we flew to the East Coast to cash in on the action. Upon arrival they sang a different tune. Local tackle shops echoed his view. Meanwhile, we were here (Friday) and couldn’t have pitched a better scenario. Our purpose was to show how well Pautzke’s Blue Crab Fuel worked when conditions were challenging and the 99-degree temperatures and warm water proved worthy. While the heat and overpowering sun was nearly unbearable from the pier it served as the perfect vehicle for a true test. We grabbed our gear and bait chicken soaked in Blue Crab Fuel and walked 20 yards past the fish cleaning area. Before crabbing it was obvious the man was telling the truth. Of the few dozen people crabbing at 2pm few had any. Most told us it was packed with anglers and crabbers that morning, but most left due to the heat and slow action. Left (Chicken soaked in Blue Crab Fuel after being used for two hours. (Right) A fresh piece of chicken soaked. It didn’t talk long for crabbers to look at us peculiarly. As soon as we opened our cooler and tied the Blue Crab Fuel soaked chicken onto the crab trap it drew attention. Most others simply used chicken. Fortunately, a friend of ours presoaked the bait the night prior. The scent (Blue Crab Fuel) had a night to marinate the bait and create the scent trail we hoped for. Within a few minutes we started catching crabs, even though action was slow. Rather than the three or more at a time we expected we lured one, but it was far better than most others had experienced. Unfortunately, many were smaller than we hoped. Nevertheless, action was consistent over the three hours we crabbed. In all, we caught two-dozen crabs, a few of which we had to released because they didn’t meet the 5.5-inch minimum. Meanwhile, we ended up overcoming the brutally slow action the experts anticipated and captured the footage filming an episode of Pautzke Outdoors in Eastern Virginia. Editor’s Note: Pautzke’s new Blue Crab Fuel is available in most Eastern Virginia Walmart stores and at Bass Pro. 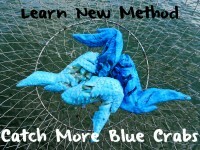 Blue Crab Fuel can be soaked in any crab bait. At least a four hour soak time is ideal in order to get the scent to penetrate the bait.